– It cost SRAM a pretty penny to acquire Zipp, but it was a smart move for several reasons. Dissect a high-end bike on a component-by-component basis: Is any single brand for any single component as coveted as Zipp is for wheels? Maybe Chris King once owned the headset with the same dominance. But the proliferation of the integrated headtube makes that ancient history. Otherwise, healthy debate exists on what’s ‘best’ for any other component on the bike. Given all of these upsides and the enormous potential energy of the Zipp brand, something that doesn’t compute is SRAM’s choice to manufacture and market mid-end road wheels under the SRAM brand instead of Zipp. I recently installed a set of their S30 Race clinchers and they’re astonishingly nice. They’re reasonably aero, they’re stable in crosswinds, they weigh just a shade over 1400g, so far they’ve proven to be durable, they’re built with multiple smart design touches that make maintenance easy, and the finishwork is quite beautiful. Up against other popular wheels in the $1,000 range (the Easton EA90 SLX, the Mavic Ksyrium SL), they’re fully competitive. 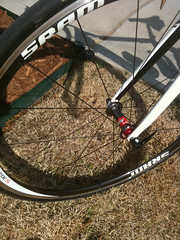 My question is this: Why doesn’t SRAM brand their <$1,000 wheels as Zipp instead? A dozen years in the retail trenches makes one fact beyond debate: Customers don't like to mix the big component brands on one bike. A customer with Shimano componentry doesn't want Campy wheels. A customer with Campy componentry won't buy Shimano pedals. And on. And on. Given the relative volume of wheel units sold, sub-$1,500 vs. Zipp's $2,000+, it's a perfect opportunity to draw customers into the Zipp pipeline at an earlier point of their bike-buying/bike-upgrading lifecycle. And whether SRAM likes it or not, most of these customers will spend their formative years on a Shimano-equipped bike. Why force them into a Mavic/Easton/Shimano wheel upgrade when they're sniffing around the sub-$1,500 upgrade range? SRAM’s argument invokes that time-honored general ledger account -- ‘Brand Equity.’ They purport that Zipp has historically operated on the high end and that their accumulated brand equity gets diluted by entering the sub-$2,000 range. This, despite the fact that Zipp has already played in the mid-end marketplace (viz. the Flashpoint family; the Team CSC/Team Issue wheels) and utterly failed because the effort was so passionless and underfueled. In using two brands to flex its muscles in the wheelset marketplace, SRAM inevitably weakens both brands. 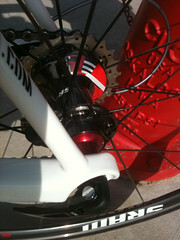 The sight of a Zipp logo arouses molten lust in most any road-rider-with-a-pulse. By denying less-moneyed customers the opportunity to indulge the feeling, SRAM kicks the door wide-open for their competition. Our preference here is to sell SRAM-family product: With only a few exceptions, it’s functionally superior or equal. The pricing is right. And, most important of all, no other brand is as keen on long-term satisfaction (for dealers and for customers) as SRAM. Their customer service is not worlds not galaxies but universes better than anyone else’s. Because of our preference, wherever there exists a barrier to putting SRAM out there, we want those barriers eliminated. – Speaking of brands and branding, what in the world is Sidi thinking with this ad? When I think Sidi, it’s the cycling industry’s link to Zegna or Brioni: Old line Italian companies doing their best to focus on handmade quality in a world of bargain-priced, Asian-manufactured, not-shabby semi-replicas of similar goods. Their Beavis & Butthead approach to marketing $500 shoes is a tone-deaf shame. – I’ve seen parts of it. Believe me, this book is a jaw-dropper. Get inside the contemporary PRO peloton -- both visually, and emotionally. – Here’s a drinking game for you: Next time you see a press release on Bike Retailer where the word ‘thrilled’ is used, everybody takes a drink. We’ll all be drunk very soon. I have felt thrill in my life before. Perhaps 3 times. A thrill is thrilling because of its rareness. Nothing conveyed via press release on Bike Retailer is thrilling to anyone involved. Please stop use of the word. In case you’re counting, our banned word list: Artisan, Curate, Robust. And, now, Thrilled. – News from the Taiwan show: The Shimano Dura Ace 7900 Di2 ‘satellite shifter’, i.e. a shifter for your tops to supplement your Di2 STI shifters. This is cool. It’s another reason to buy Di2. It’s more proof that Di2 is here for the long haul. And it’s unequivocally an advantage for the classics when riding on the tops is sometimes an ingredient for survival. – Does anybody know these guys? I think they’re Dutch. They’ve stolen our Pegoretti photos and that kind of irritates me. I’ve tried calling to talk nice and they don’t answer. – And a quick note of housekeeping: I’m stepping out for a spell of double-secret training. I’ll be dressed in black the whole week. Soon enough, I’ll be climbing in the drops, if you know what I mean. Also, it means I’ll skip next week’s column so please expect a new What’s New in two weeks.